The Christian Admiral Hotel was demolished in 1996 for a new single-family development. The Christian Admiral Hotel, originally known as the Hotel Cape May, was the centerpiece of the turn-of-the-century project to revive the tourist economy of Cape May. The massive Beaux-Arts style building was erected between 1905-1908 and was one of the most luxurious hotels of its time. This building is strongly associated with Cape May’s history, with the urbanization of eastern cities in the late nineteenth century and with the development of railroads. The Christian Admiral Hotel is a rare survivor among “railroad hotels,” which were created by railroad developers as a destination for their passengers from the rapidly expanding urban areas like Philadelphia, Baltimore, and Pittsburgh. The Christian Admiral Hotel is constructed with a steel frame and brick walls, a type of construction that was a new development at the turn-of-the-century and typical of railroad hotels. It’s “U” shaped form, its monumental staircase, its progression of spaces from portico to lobby to cross-hall, is all characteristic of railroad hotels and the Beaux-Arts style. The building has been vacant since 1990. 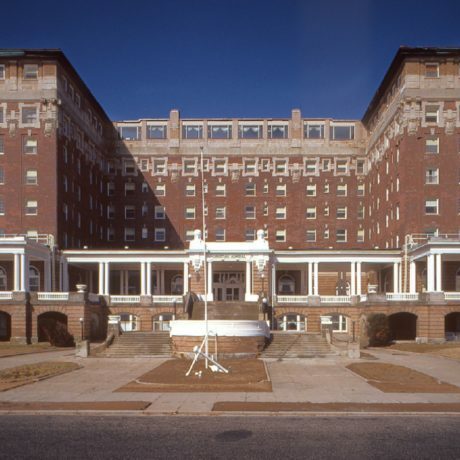 In 1996, the hotel was demolished for a single-family housing development. Its demolition put into question Cape May’s National Historic Landmark status.